Join the discussion on our forums! Come discuss Spirit Bomb over in our dedicated Spirit Bomb discussion topic. Deal $4 damage to a minion and your hero. Might take a few episodes to power up. The golden version looks more like a Spirit Teakettle. Even if its a bomb, that golden animation gives a feeling of calm to me. 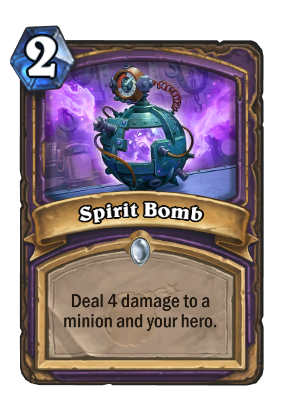 I would just say "Shadowbolt" but this has tons of synergy with Lesser Amethyst Spellstone and Nethersoul Buster, spellstone has been looking for this kind of synergy and it's good. Also, even cost. Strong as a removal but require some other cards with self damage synergy to really shine. It is better than Shadow Bolt because of its synergy potential. Wonderful card. It activates spellstone for control, increases attack for zoo, providing 4 mana 7/7 for both. Unless you're putting this in a Masochism Warlock, just run Shadow Bolt instead. The power level of this card, it's... very high? Larger than another number? Something like that. I think its power level is over 9000.